Barbie can learn anything. So can you! Her inspiring workbooks cheer you on through every step. Do you love fashion, sports, shopping, jewellery, parties or hanging out with friends? 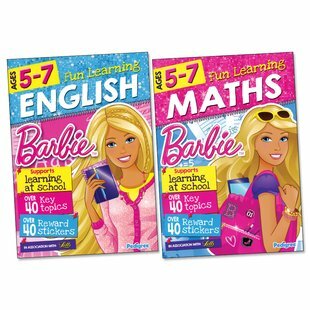 Well – Barbie’s lovely new workbooks are themed around all those wonderful things. Open up for gorgeous puzzles, activities and games which cover key topics you need to know for school. Plus over 40 reward stickers and heaps of Barbie facts and fun.